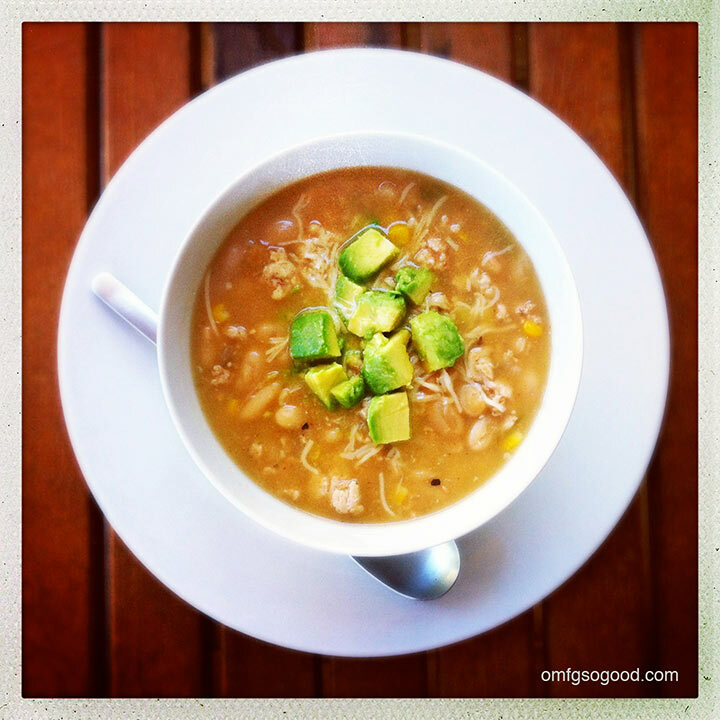 white bean chicken chili verde | omfg. so good. Sometimes I really miss the visual change of seasons. In Arizona we seem to just transition slowly from Summer to Fall with a gradual change in temperature, but everything else stays the same. Blue skies, palm trees, fancy schoolyard moms wearing tank tops and shorty-shorts. I’m jonesin’ for a good old fashioned leaf change and a navy wool peacoat. Yup, I’m ready to start wearing boots. But it’s still 100 degrees outside, and sweaty feet are gross. So instead, I’ve thrown myself into concocting a crap ton of soups and stews for the last two weeks to get myself into Fall mode. It’s working like a charm. 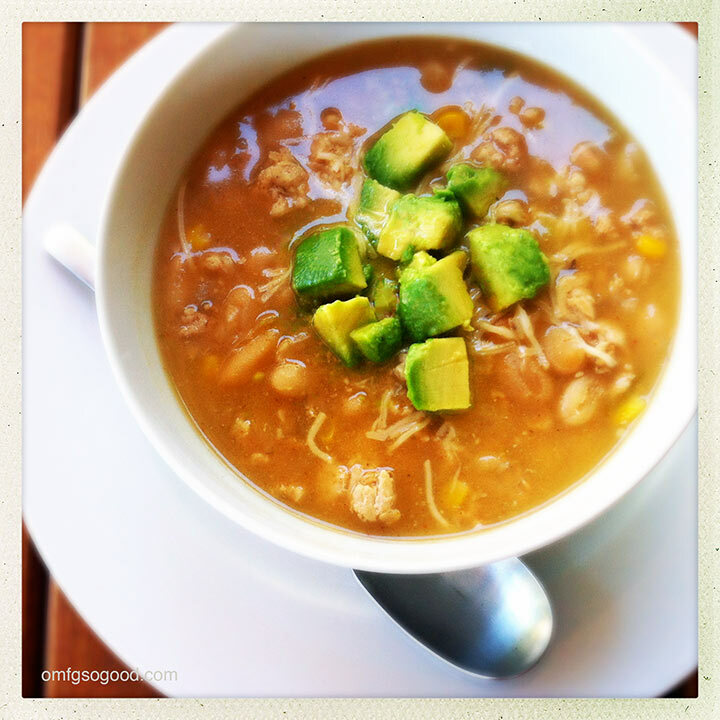 This chicken chili may just be my new Fall favorite. Think fire roasted green chiles, sweet corn, and fresh avocado tossed in lime juice, combined with the perfect hint of traditional chili flavor. Um, yum. 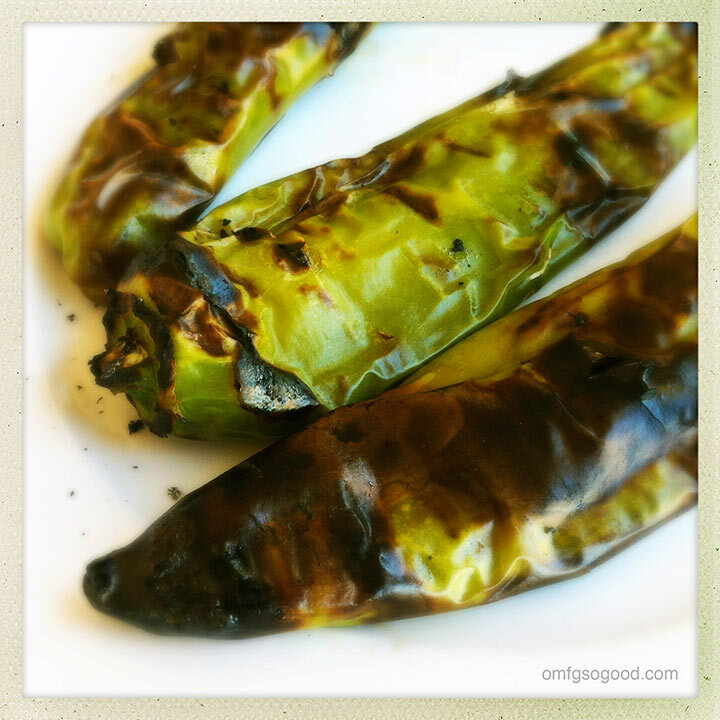 Don’t be intimidated by the idea of roasting your own green chile. It’s actually pretty easy and well worth the effort. To start, preheat your oven’s broiler then rinse and dry the peppers with a paper towel and plop ’em on a sheet pan lined with either foil or parchment paper. Place the pan under the broiler, as close to the heat source as you can get them. (You can also do this on a hot grill.) Broil them until the skin gets nice and charred (ie, black) then remove the pan, flip them and repeat on the other side. The entire process takes around 10 minutes. When the peppers are nice and charred, throw them directly into a ziplock bag and seal it to trap in the heat. The moisture will pretty much make the charred skins fall right off. After a few minutes, remove them from the bag, peel the skins off, slice them in half and run a sharp knife down the length of each to scrape off the seeds. Chop those bad-boys up and you’re done. Bingo-Bango. Add the flour and stir to coat. Cook this mixture for a few more minutes then add the chicken broth and stir to combine and slightly thicken. Add the beans and corn then simmer over low heat for 35 – 45 minutes, or until the liquid has reduced to around half and the chili has thickened. Add the crushed red pepper flakes and simmer for another 10 minutes. Serve topped with shredded parmesan cheese and cubes of fresh avocado tossed in lime juice. And maybe a glob of sour cream, if you’re feeling naughty. Mmmm-hmmm, it’s official. My new favorite. Beautiful dish. Years ago I was in AZ driving to the Grand Canyon. In one day it snowed, rained and then got so hot I wished I had shorts. Felt like I was back in NE!